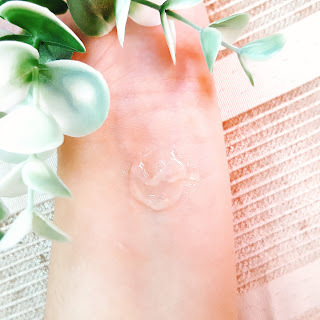 Hello lovelies, i am back with yet another review. Today i am here to review a Skincare brand which i fell in love with! 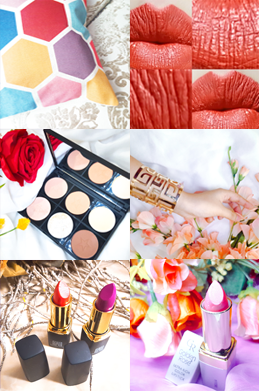 Annie's Way is a Skincare brand which is loved Internationally. 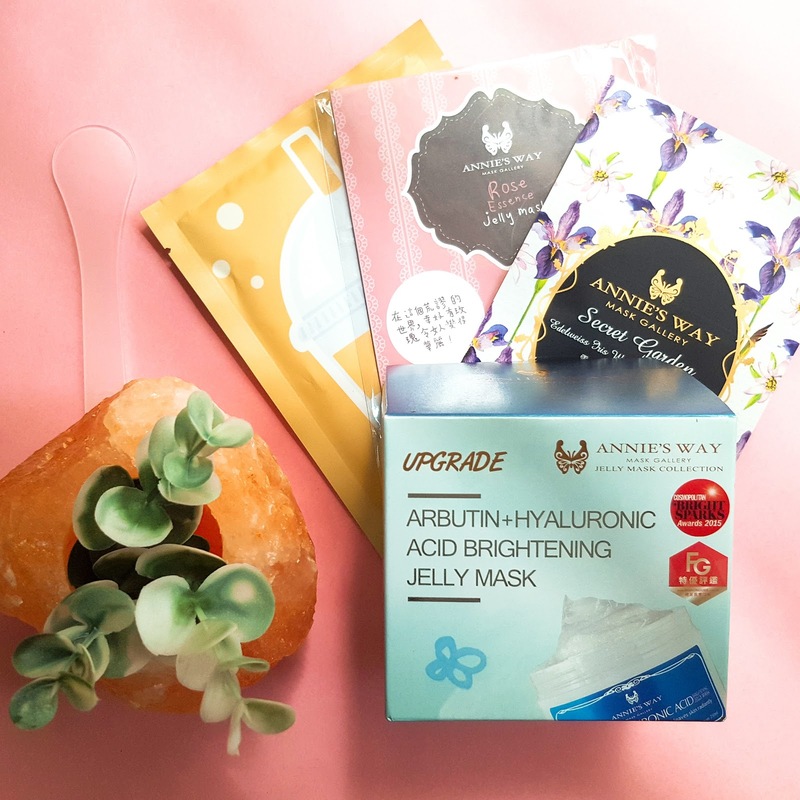 They are extremely popular for their jelly masks but they produce good quality Sheet masks as well. Annie's Way products are steroids, antibiotics, paraben and alcohol free. I tried few of Annie's Way products and i can proudly say that their products are famous for a reason!! Today i will be reviewing 2 of their Jelly masks and 2 of their sheet masks. 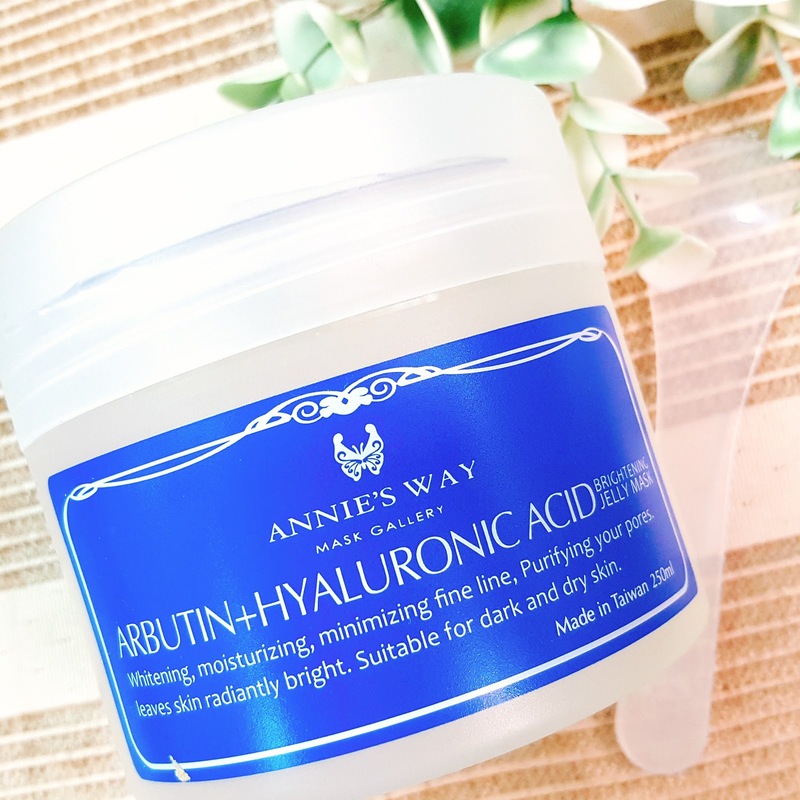 The first product i am going to review is Annie's Way's Arbutin + Hyaluronic acid brightening jelly mask. 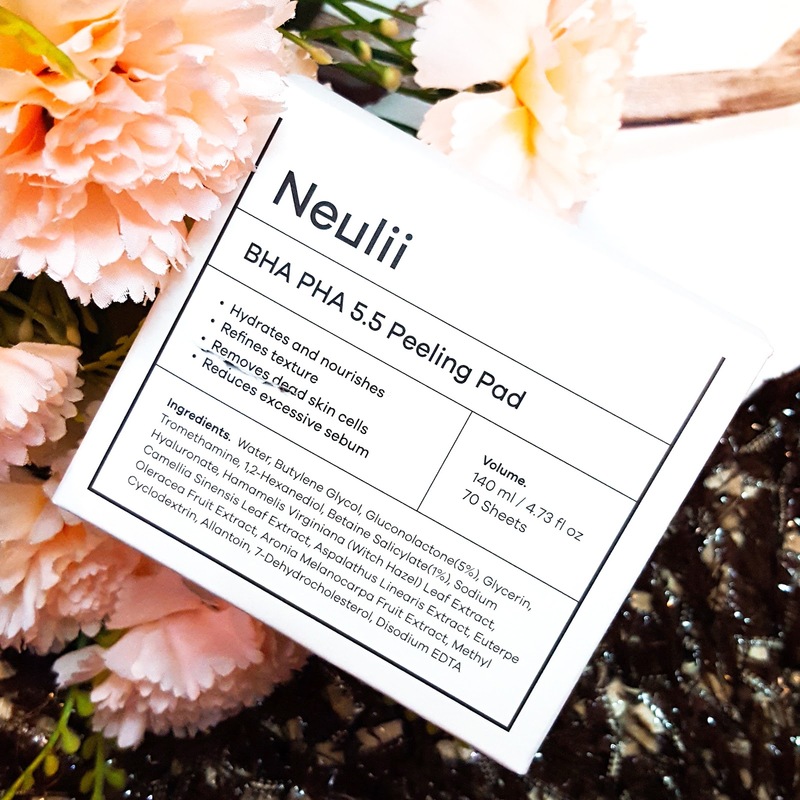 As the name suggests this jelly mask has Arbutin and Hyaluronic Acid as their main ingredients. Alpha Arbutin minimizes irregularities & dullness for a noticeably brighter complexion, leaving the skin refreshed, soft, smooth and clean. Whereas, Hyaluronic Acid helps to moisturize skin and make it look younger and firmer. This mask comes in a sturdy plastic jar which is packed in a cardboard box. The cardboard box has all the ingredients and instructions mentioned on it. This jelly mask also comes with a spatula which makes the application of the mask really easy. Applying this mask is super easy. 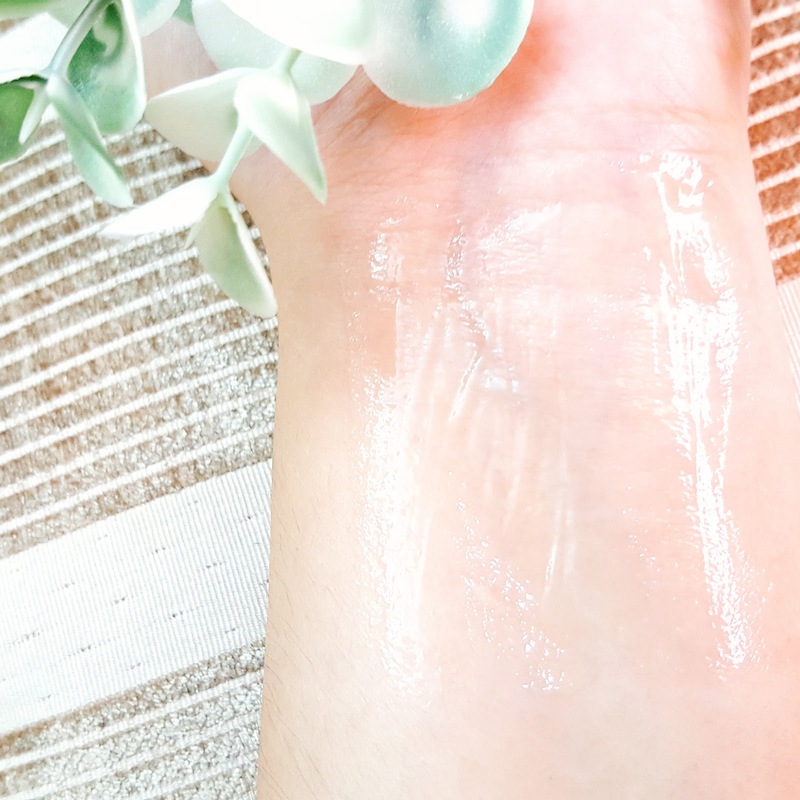 With the help of a spatula you are supposed to apply a thick layer (0.3 cm -0.5 cm) of the jelly mask on your face and after 20 minutes you can remove the jelly mask with the help of the same spatula. After scraping the product off of your face you can easily rinse it off. 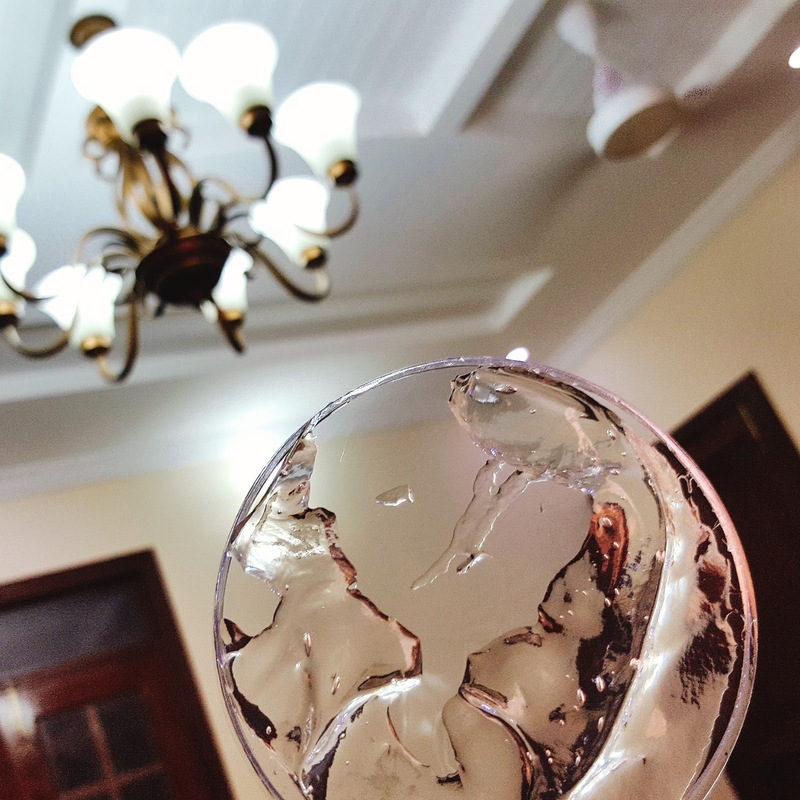 The Jelly itself is transparent and has a mild smell. The first time ever i applied this mask, i was literally shook because i was able to notice the results in just one try. 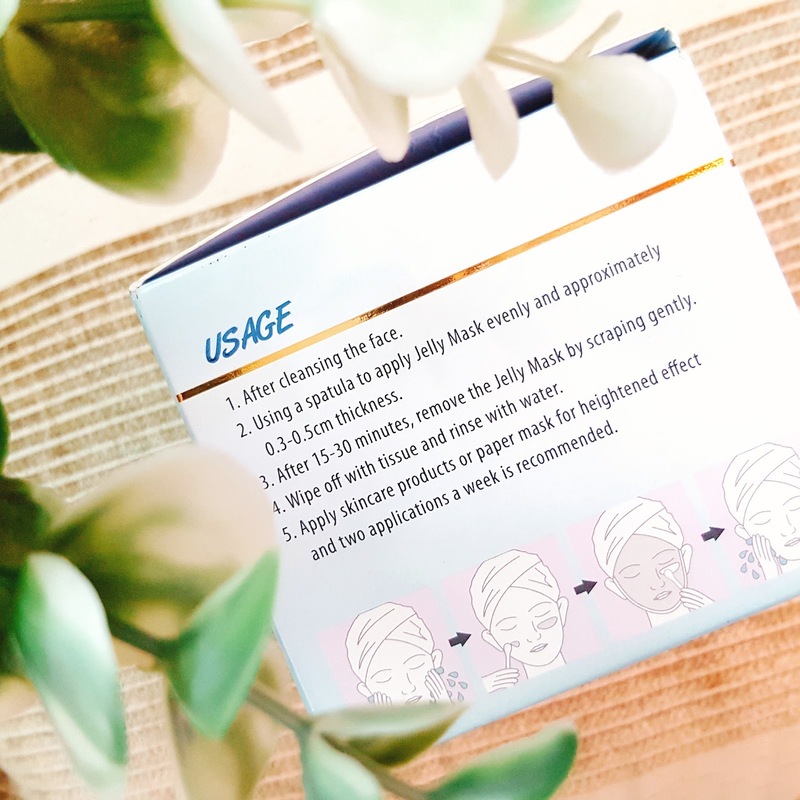 My skin looked so much brighter, softer and refreshed after the first use. I have been using this mask once every week and i have noticed that my dark spots have lightened a lot and my skin looks so much brighter. I love the fact that this mask comes with a spatula 'cuz it is really easy to remove all the dirt and dead skin from my face while scraping the mask off with the spatula. I have also noticed that my black heads have reduced a lot since i have started using this mask. This mask is valued at $17.97 for 250 ml of product and trust me this mask is worth every penny! 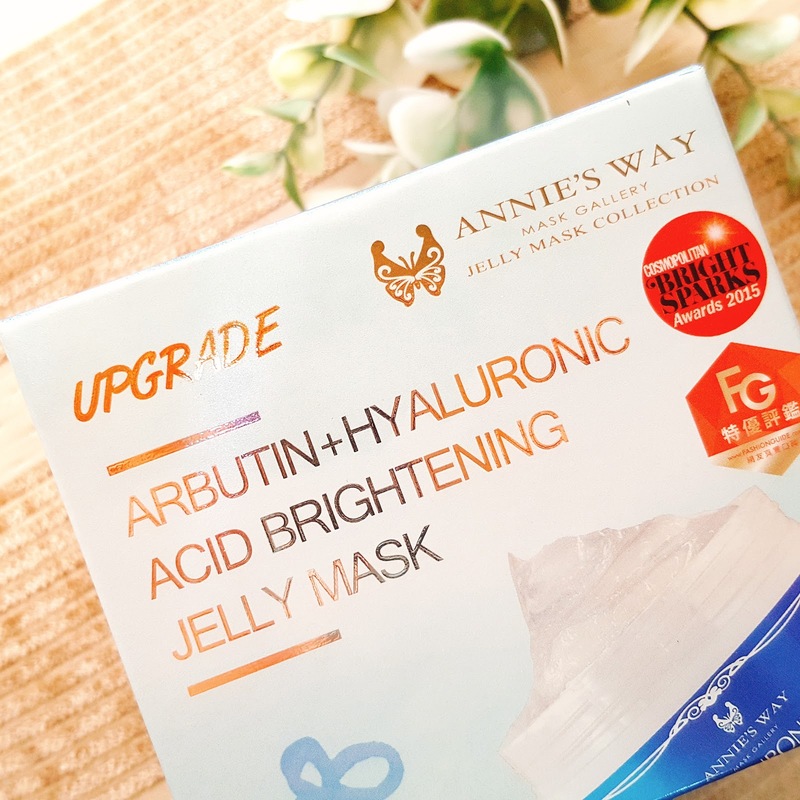 One thing great about Annie's Way's jelly masks is that they are available in 2 sizes. One is 250 ml of product which comes in a Jar and the second one is 40 ml of product which comes in a plastic pouch. 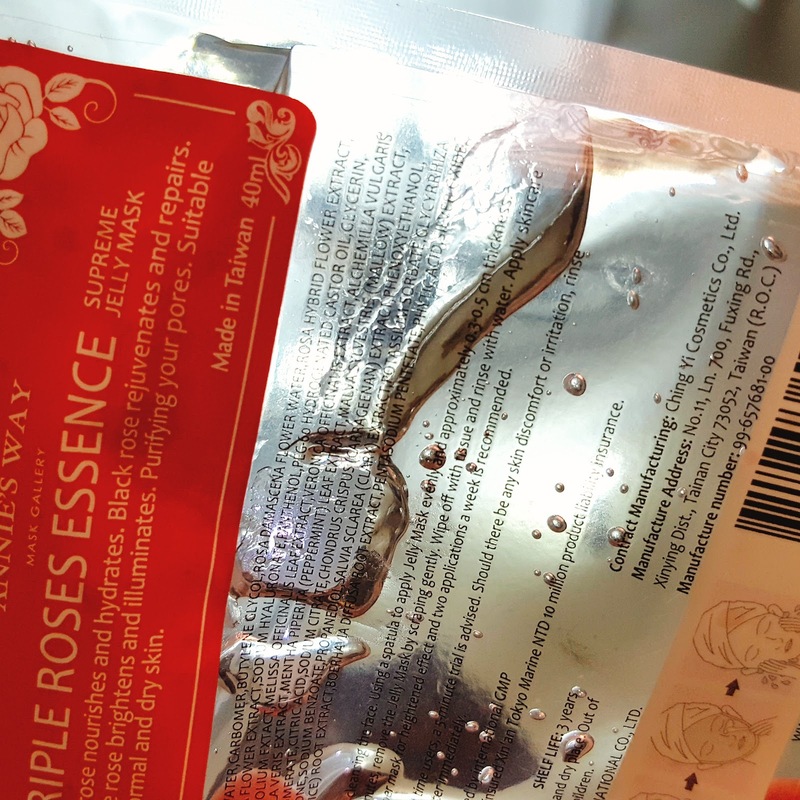 The second jelly mask which i am going to review is rose essence jelly mask. 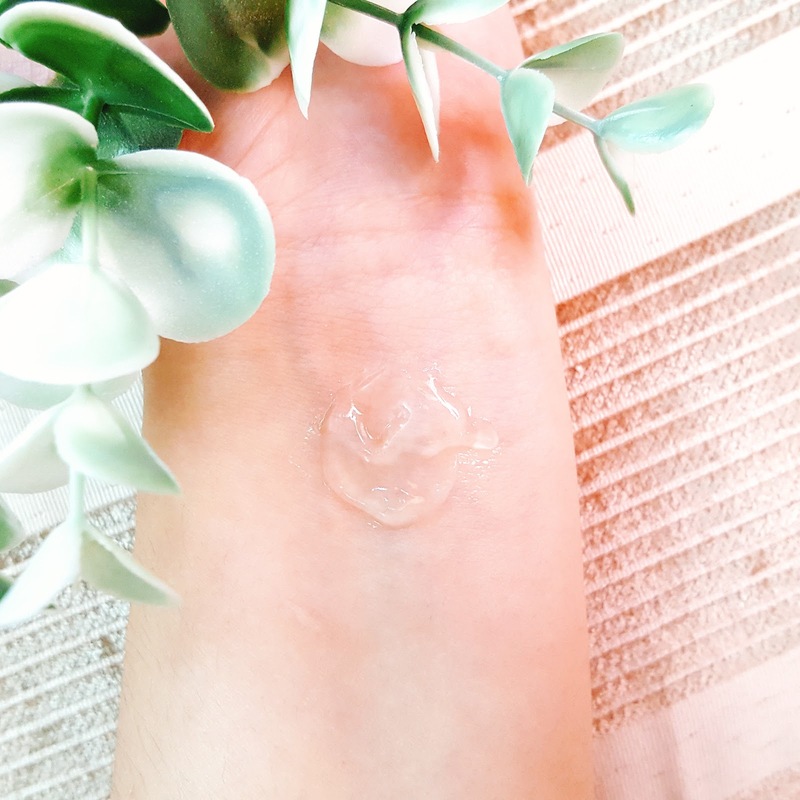 The rose essence jelly mask is meant for cleansing and toning skin in just 20 minutes. Rosa Damascena Flower Water:Hydrates, Firms and whitens Skin. Rosa Centifolia Flower Extact: Smoothens and refines skin texture. Saccharide Isomarate: provides long-lasting hydration. The plastic pouch or sample sized packaging is a good idea by the company as trying out a product before buying the full size is very logical. I love the fact that the plastic pouch has a sweet little message "You're unreplaceable treasure" written on it. 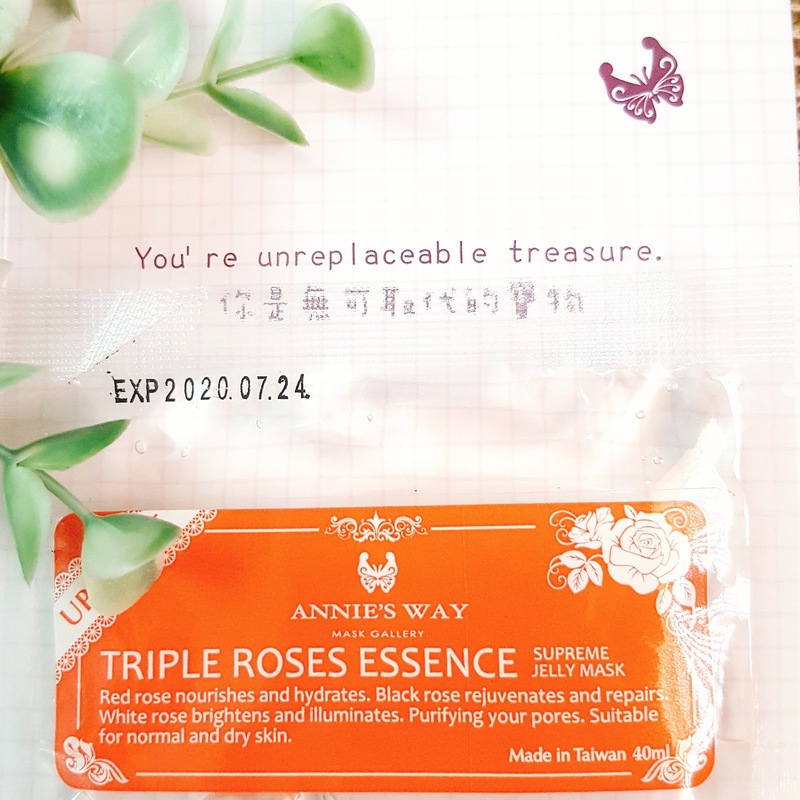 The triple roses essence present in this mask gives this product a very mild floral smell which is so refreshing. I have tried this mask three times and i can say that it just doesn't smell good but it actually makes my skin feel rejuvenated. My skin feels so hydrated and smooth after every use. I have noticed a huge difference in my dry skin after the use of this mask. If you have dry skin , i would really recommend you guys to use this mask as this mask is very hydrating. 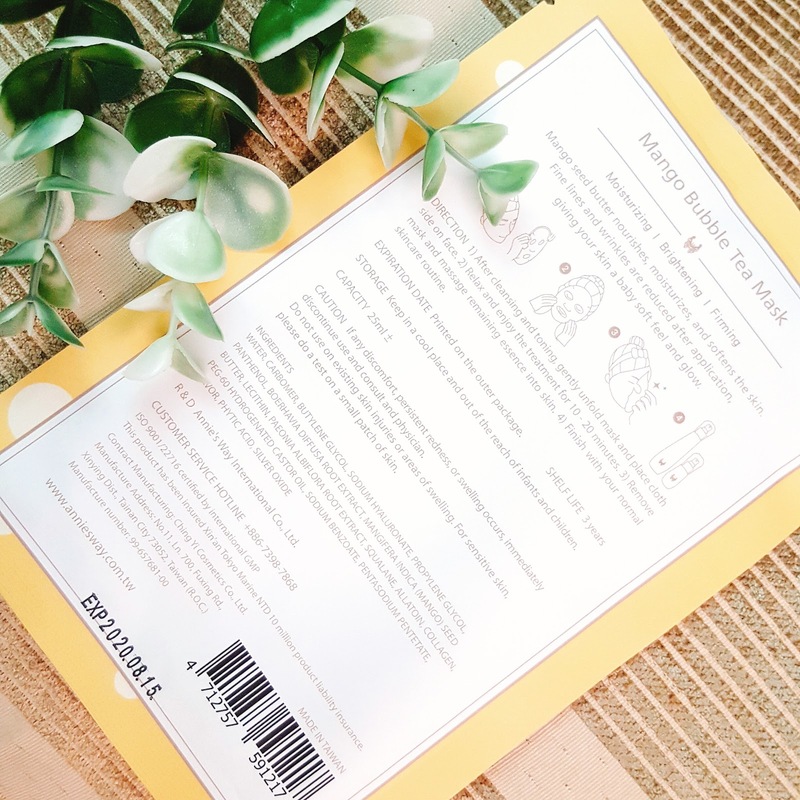 This mask also has anti-aging properties, i can not say much about anti-aging properties of this mask as you have to use this mask for a longer period of time to notice results but i can safely say that my skin surely feels firmer after using this mask. This mask is valued at $5.61 for 40 ml of product. 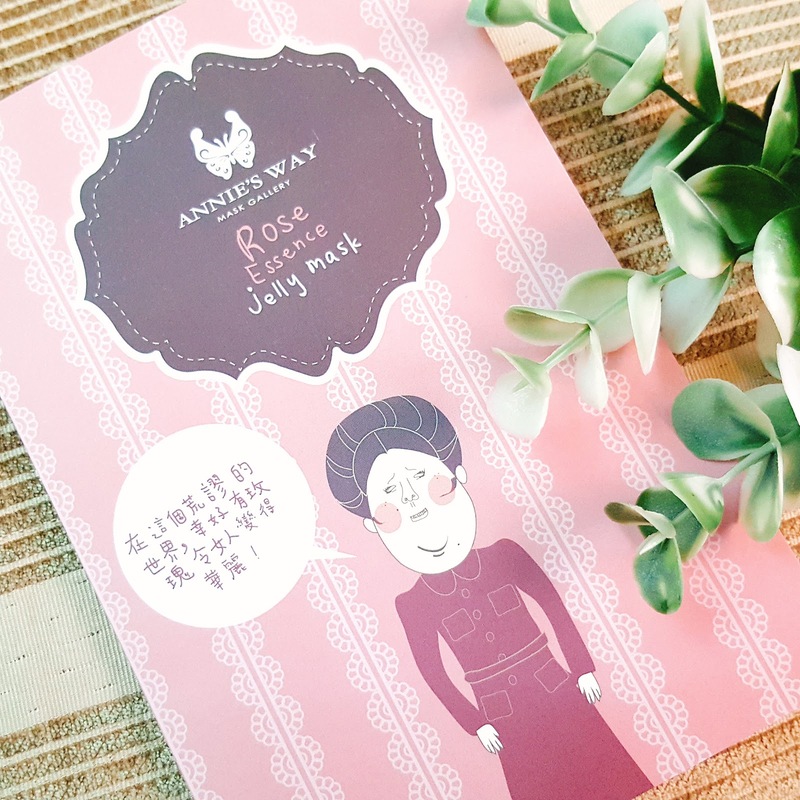 Now i will be reviewing two of Annie's Way's sheet masks. The first mask is Mango mask from their Bubble Tea Mask series. 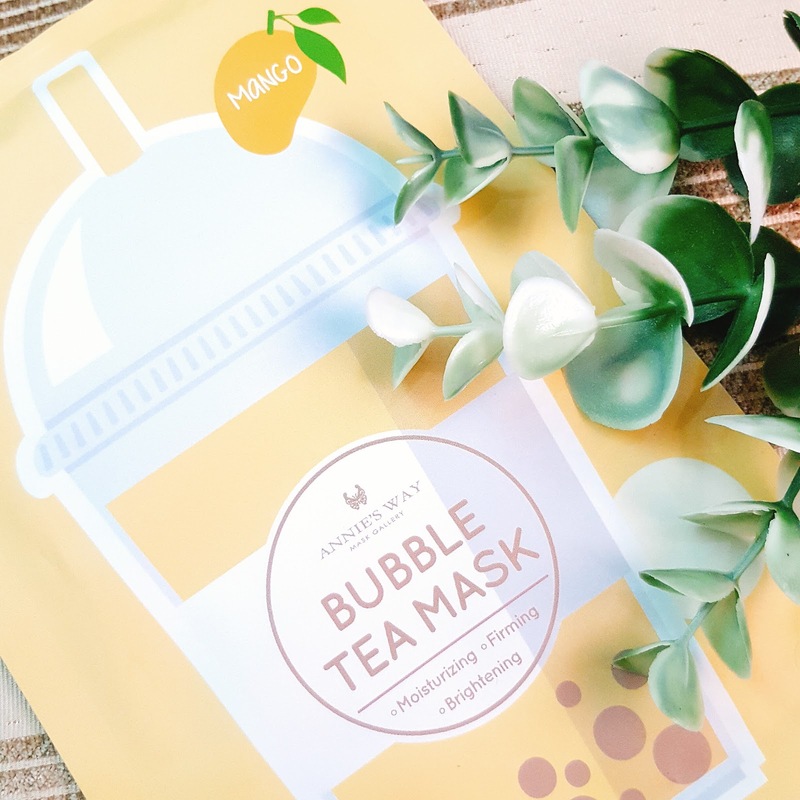 The mango bubble tea mask is meant for moisturizing , brightening and firming of skin. This sheet mask was transparent and adhesive. The mask itself was really thin but it didn't tear at all. The size of the mask was also perfect for my face. This mask has a fruity smell which fades away with time. I applied this mask after a very tiring day. While on my face this mask gave me a cooling sensation which made me feel so relaxed. After removing the mask my dull skin after a long day in the sun looked brighter and hydrated. A beautiful glow was also visible after the use. This mask is valued at $3.71. 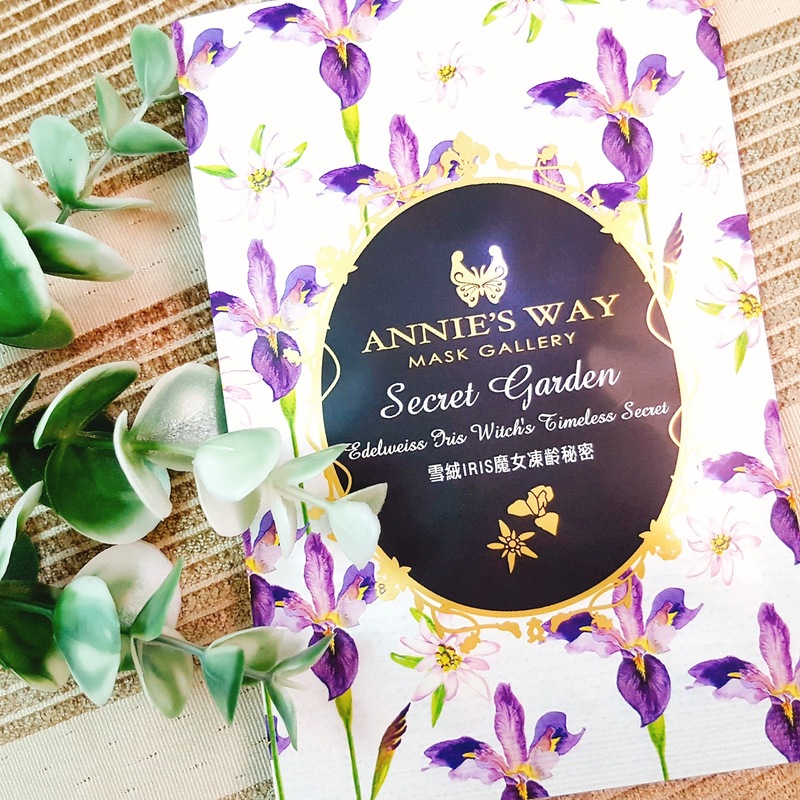 The second sheet mask which i tried from Annie's Way was this Edelweiss Iris Witch's Timeless Secret from their Secret Garden series. This mask is meant for increasing gloss in skin and making the skin smoother and tighter. 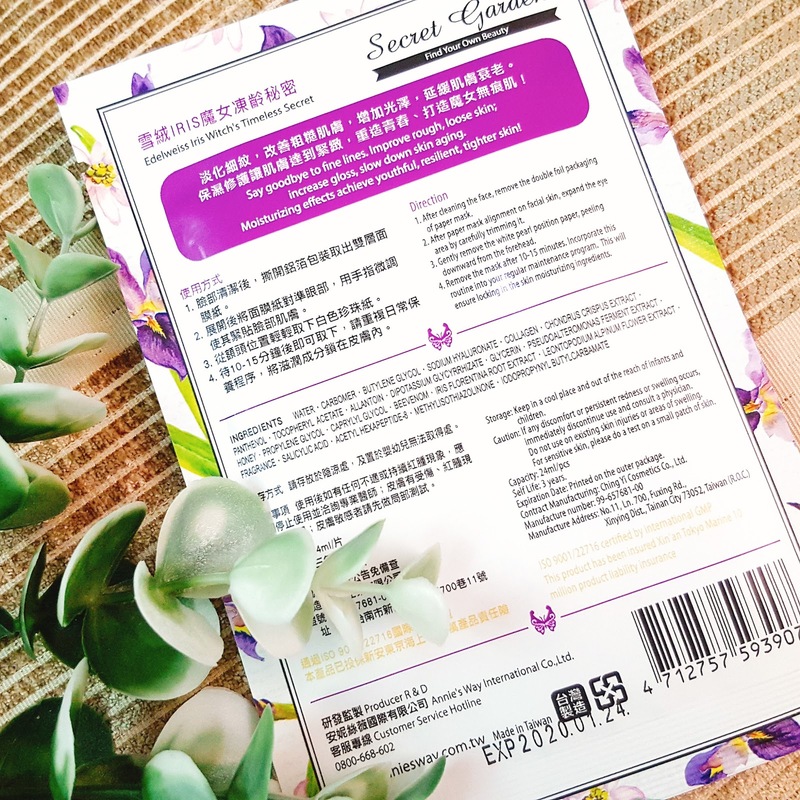 If you are interested in making the use of Anti-Aging properties of this mask then i would recommend you guys to buy a bundle of this mask because i don't think anti-aging properties can work in just one use. This sheet mask has a beautiful packaging. The mask itself is black in color. This sheet mask has a mild fruity smell. The mask is thin but super easy to put on. You can take out the mask , open it and apply it on your face. remove the silver lining after placing the mask in the right place. This mask was dripping with essence when i first took it out. On my face this mask had a very cooling and calming affect. After removing the mask my skin was glowing which i loved. 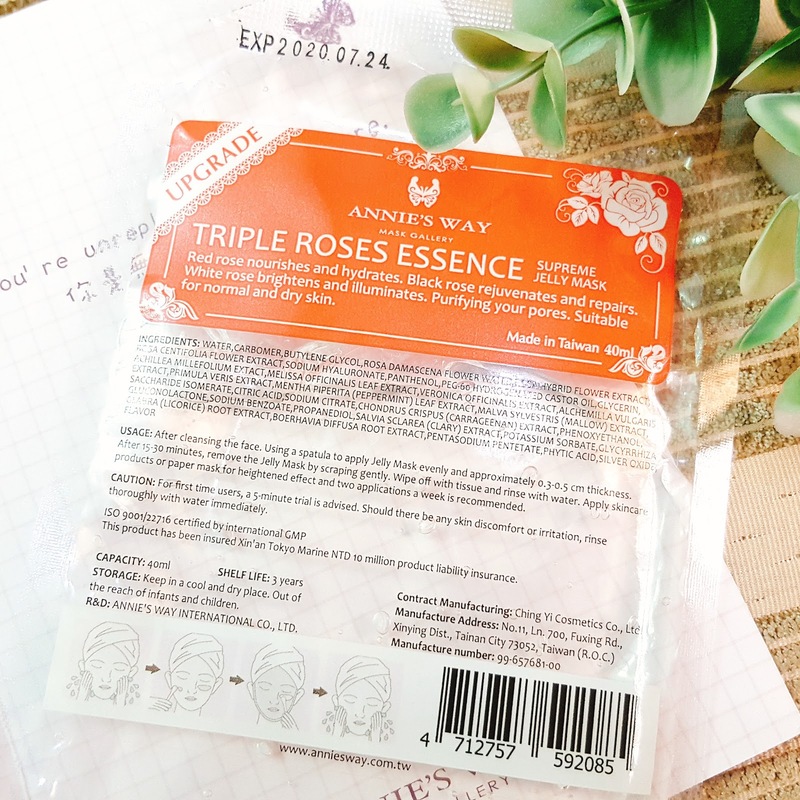 I am very much impressed by all the products i have tried from Annie's Way. The best thing about all the products is that the products deliver what they claim. 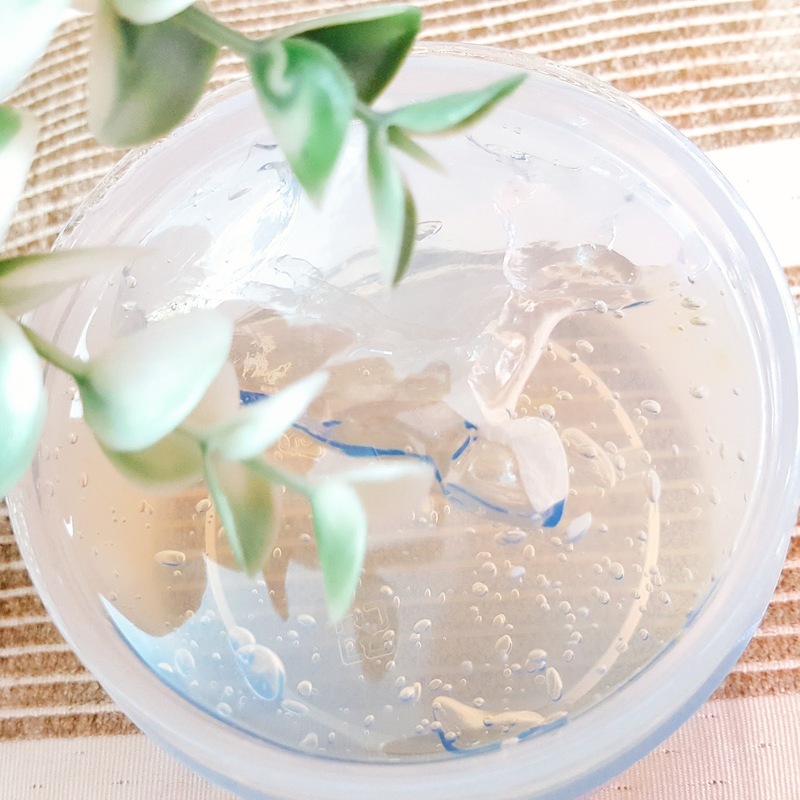 Though i like all the products and would definitely try some other products from them, my favourite mask from them is surely Arbutin + Hyaluronic Acid Brightening Jelly Mask. 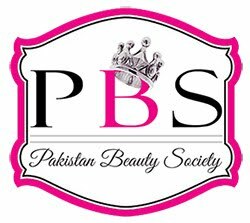 I would really recommend you guys to try their products if you feel that your skin needs hydration and brightness. This is all for today, for more details about the masks please visit Annie's Way's website HERE.